There’s nothing quite as satisfying as a freshly grilled burger with all of your favorite toppings. Being someone who likes to play with his food, I’ve tried a few twists when it comes to the “perfect burger”. Grinding your own meat is definitely one of those ah-ha moments that’s worth the trouble. I use a Kitchen Aid stand mixer with the food grinder attachment. This combo will take just about any cut of meat & turn it into a perfect ground consistency. While I’m a big fan of grinding Brisket I have recently found a good chuck roast will yield acceptable results at about 1/2 the cost. Unless I’m feeding a large crowd (in which I may cut a back a bit) I aim for 8oz patties that are packed firmly and wider than your bun by about 25%. This gives you the right amount of meat to bun ratio and has enough mass to keep the patty from drying out while cooking. I always keep the seasonings to a minimum. A light dusting of seasoned salt or plain old salt/pepper is all you need. I have two methods for cooking the perfect burger. Outdoor over charcoal (first preference) or indoor on a well seasoned cast iron pan (backup plan in the case of inclement weather). Both methods create, in my opinion, the perfect result. Since you’re grinding your own meat the risk associated with commercial ground meat is greatly reduced. I typically cook my hamburgers for 5-minutes per side (flipping only once) on a medium-high grill (or pan). 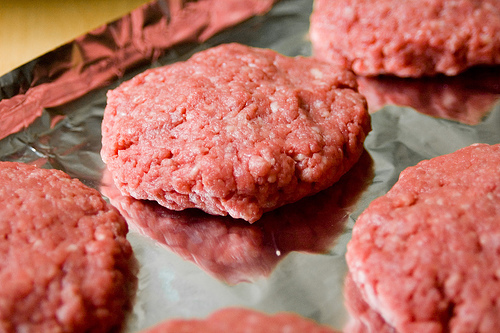 This yields a juicy burger that’s just cooked through. When it comes to condiments I like to keep it simple (only 2-3 at a time), usually mayo, onion and a little mustard. My wife turned me on to olives with burgers. The saltiness of the olive goes nicely with the juiciness of the burger. About the only this missing right now is a cold beer! How do you do your burgers? Previous Previous post: WordPress 2.6 Is Out! Next Next post: Pandora Radio – Works Without An iPod Too!